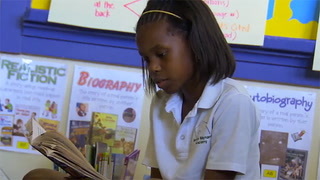 See how work at the beginning of the school year teaches students the expectations around guided reading How do students know what to do at each station? How does Ms. Ogier know students are ready to do the guided reading hour on their own? 1. I absolutely love how the teacher models her expectations, observes the students practices, and then she knows when they are ready to be independent. She gives simple, clear directions to her class, and makes it easy for them to follow. 2. She knows when her students are ready to work during the guided reading hour when they can work independently, and are meeting her expectations. Jenna relays expectations for students by giving clear, and precise directions to her students by role modeling, and then giving students a chance to prove that they understand classroom expectations before she starts her small groups. I like how she relays to students that group time is important. Her small group seemed excited for time with their teacher. Great video! My favorite part is when she teaches her "scholars" how to not interrupt during Guided Reading time. This is very important to make sure that workstations are effective. The teacher explicitly teaches the student procedures.The students practice until they are familiar with all stations procedures. I like the idea that once the teacher recognizes that all the student understand the procedures and systems in all the stations, she adds a new one. This is a system I will utilize next school year. Appreciate the reminder to teach procedures slowly and practice, model, then practice some more. Jenna: I definitely think that the hardest thing about Guided Reading is probably the management piece. Being able to manage 31 students who are working independently and then pulling four or five of them to work on a skill. Two things are happening. So, it's really important getting that independent work time piece in place.
" 'Someone had written Mrs. Jules is as fat as a hippopotamus, and she smells like one too.' "
The most important thing is explicitly teaching your procedures. "So, go ahead, take responsibility." My students know where the reading workstation bins are located. They know how to use them, and then also how to put them back. How to transition from the rug to the beanbags, or to your desk. What do you do if you have a question? Or, what do you do if you have to go to the bathroom? And, so I feel like my students are very clear about what Guided Reading should look like, sound like, feel like.
" 'Her parents said they wouldn't let her stay up past midnight. She did her best...' "
And, we do many lessons, just talking about it, practicing it, um, and reflecting on it. "Thank you to all those scholars who gave me their eyes. Like, how even scholars on the carpet, putting down their pencils, giving me their full attention." Every single system, procedure, work station, was absolutely directly taught, where I had to...we modeled it, there was a guided practice where we all practiced it, and then independently I was like "OK, and now I'm gonna watch you do it." And, so I started out the year with just teaching them what is silent reading, what does it look like, what does it sound like, what does it feel like? And, then we practiced that. And, then once I see that scholars are taking responsibility, and know how to use that workstation, we keep on adding more and more. "Today, I'm gonna teach you one more workstation. Do I have a volunteer to help me model how you would do this workstation with a partner? Julianna? You wanna do it? OK, come on." "And so, I can be the reader and Julianna, you can be in charge of the timer. OK? So, when I start, go ahead and press Start, OK?" I model it with another student.
" 'Everyday in places around the world...' "
So it's super clear what should it look like when I'm at this workstation, and then we practice that. And, I did not start meeting with Guided Reading groups until all the students could prove to me that they could work independently for that one hour of time, without me. And, once they were able to demonstrate to me that "OK, we're able to rotate to these different workstations", then I was like, "OK, now we're ready, now I can finally begin pulling groups." You would think that scholars would know what you meant when you you say "Walk quietly to your seat and take out your blue classwork folder, but that's not necessarily the case. "Thank you Nila and Dianni are ready. They're giving the quiet signal." And, so, in order to make sure that we're using our time most efficiently, all of those transitions were explicitly taught and practiced. "And, once you are done with all those must do's, then you will do the ..."
So, after the mini-lesson, I made sure that the directions were really clear about what they were going to do next. "OK, scholars, when I say "Go! ", you're gonna take out your blue classwork folders. OK? Go!" They all transition to their seats. They know immediately to take out their blue classwork folders because that's where all of their must do's and Guided Reading work is. And, to immediately begin. And, then once I see that the class is like, in that mode, then I know "OK, I'm ready to pull the first guided reading group." I normally use the bell, and I'll just ring it three times and then I call whatever Guided Reading group. "Thank you scholars for all those who gave me their eyes. Can I have my first Guided Reading group, Redwood, please come to my table with all of their Guided Reading materials?" 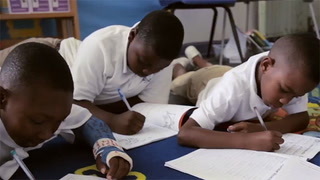 And, then those scholars know to bring their Guided Reading notebook, their blue folder, their Guided Reading book and a pencil, and they know to come to me like, prepared and ready to go. "Are you ready? You look ready, sir. Thank you." I really emphasize to my scholars that during Guided Reading, it's really important that the teacher isn't interrupted, unless there's an emergency. Student: "I think that it means..."
Jenna: And, we did a big talk about why it's so important not to interrupt that time, 'cause it's..we call it our "Knowledge for College" time. Scholars are getting help, and how frustrating is it when a million other scholars are lining up and they have questions, and all these things. So, scholars know not to verbally interrupt me. It makes the job so much easier. "Our reader's workshop time is up. Can scholars please make sure that all workstations are carefully put away on the rug, and scholars are showing me they're ready to go to lunch? Let's see how quickly and quietly we can do this. Go!"